We might be closing out the work week with a new review, but that doesn't mean we're closing out the regular old week in general. No, tomorrow SuperPhillip Central will also have a new review to share with you. 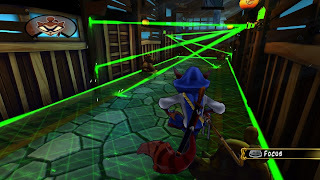 For now, take this glimpse at our thoughts of Sly Cooper: Thieves in Time for the PlayStation 3 and PS Vita. The PlayStation 2 was an embarrassment of riches for 3D platforming fans. Sony debuted and published not one, not two, but three unique platforming franchises on the system. 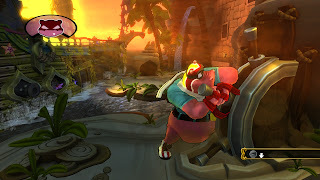 The first was Naughty Dog's Jak & Daxter, then there was Insomniac Games' Ratchet & Clank, and the final in this all-star trio was Sucker Punch's Sly Cooper. Each series possessed its own strengths and charms, and while Ratchet has appeared in multiple games on the PlayStation 3, Sly Cooper has been waiting in the wings for his own brand-new title. 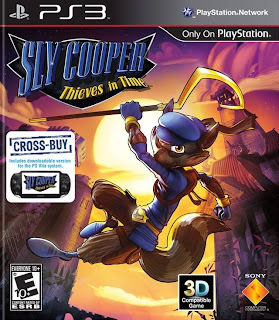 That day has finally come, but this time around, Sanzaru Games (the folks who developed The Sly Collection) are the folks behind Sly's latest caper, Sly Cooper: Thieves in Time, available on PlayStation 3 and PlayStation Vita. 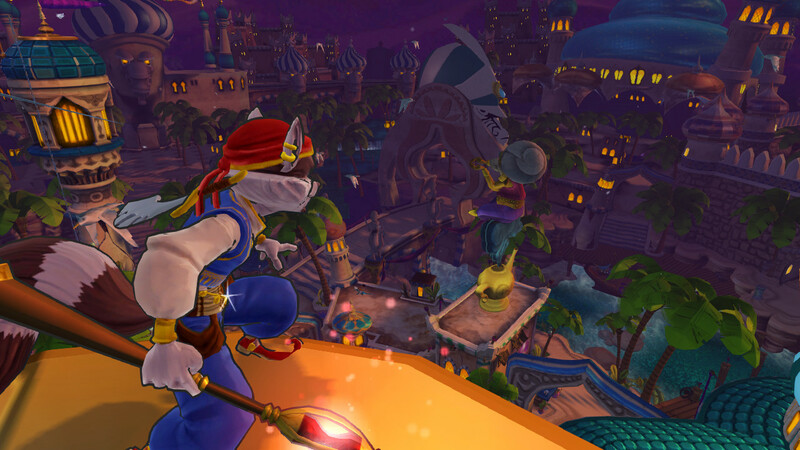 Does Sanzaru Games do Sucker Punch's series justice, or does the latest Sly Cooper need a time out? The Thievius Raccoonus is a book containing all of the family secrets of the Cooper clan. One day, however, while perusing the book, Bentley the Turtle notices that right before his eyes the words on the pages seem to be vanishing. It turns out someone is trying to erase the Cooper legacy by going back in time, causing trouble, and doing his or her best to stamp out the Sly Cooper and his ancestors for good. Packed with a new time machine, the Cooper gang and their van hightail it into the past to attempt to right the wrongs of this vicious villain. Thieves in Time tells its tale through a number of means: traditional in-game cutscenes as well as marvelously done hand-drawn cartoon animations. Perhaps the only quip one could make about the story is that most scenes can be skipped through the pause menu, but it isn't consistent. Not every scene can be skipped, meaning that replaying jobs can be quite annoying when you have to sit through a 45 second scene. Sly Cooper: Thieves in Time consists of five episodes taking place from Feudal Japan to the sunset-soaked Arabia, sandwiched between a prologue and an epilogue. 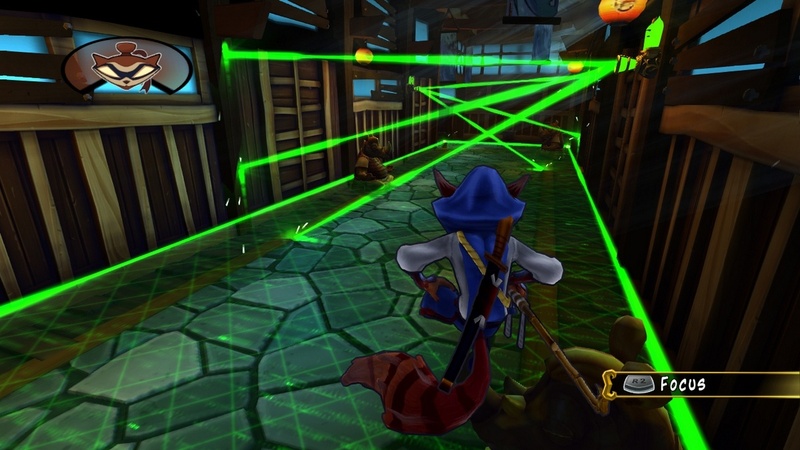 Like past games in the Sly Cooper series, each episode is a fairly contained but fully explore-able area where Sly and one of many other playable characters can venture around, smashing 30 clue bottles strewn across each episode, collecting treasure, and just having the pure, unadulterated freedom to explore. Jobs are the missions that move the story of Thieves in Time forward. Each one begins by selecting the appropriate character sitting in the Cooper hideout. There is generally 5-7 jobs per episode, and each must be played in order. The first is usually a reconnaissance mission, requiring Sly to take photos of the new area for Bentley to devise a plan of attack, and the last is where everything comes together to take down the villain leading the crime spree of that place and time period. 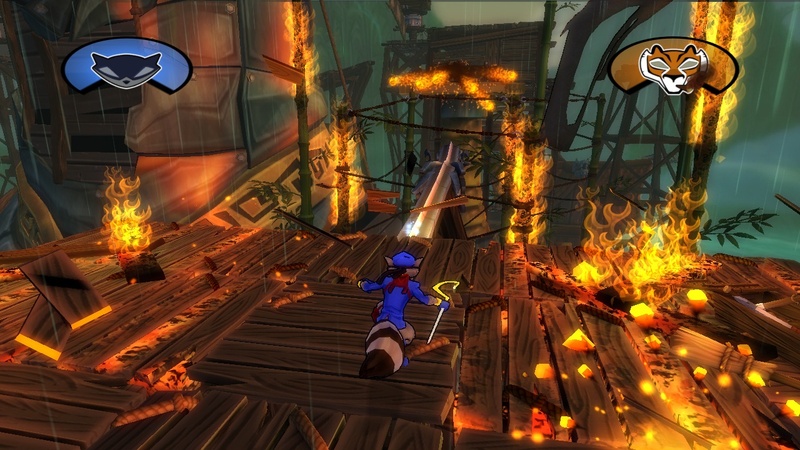 The platforming in Sly Cooper: Thieves in Time is remarkably pleasant. You seldom, if ever, feel like you're not in control of whichever character you're using. Sly Cooper has the most moves and mobility to work with, allowing him to climb on pipes and trees, tiptoe along high wires, and sidestep across narrow ledges. 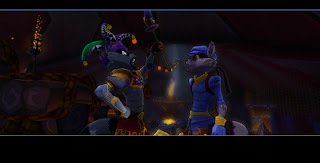 When you see a blue sparkle above an object, that is your indication that it is something that Sly Cooper can cling to. This is performed by tapping the Circle button near such an object. Thieves in Time will certainly put your platforming prowess into action with ingenious obstacle course-like design. Even if you fail in a job, there are plenty of continue points so you are never having to redo large portions of a level. in Time definitely has you covered. Variety is the spice of life, and in the job market that is exactly what you get with Thieves in Time. The developers have gone a long way in ensuring that players don't get bored doing the same tasks over and over again. While there are job archetypes that do repeat themselves (if I don't have to stealthily follow someone again, it will be too soon), most jobs differ from one another. Outside of the traditional platforming that makes a platformer a platformer, there are parts of jobs where you participate in mini-games. One you'll be serving sarsaparilla to some very thirsty saloon patrons, another you'll be shaking Carmelita's booty, timing your button presses in beat with the music to distract the guards. There's multiple hacking mini-games like Alter Ego, a side-scrolling 2D shooter; a tank game using both sticks, one to move and one to aim; and Spark Runner, where you tilt the Sixaxis controller to move a spark through a maze. The latter type of hacking mini-game can be frustrating, as the tilt controls are not the best. 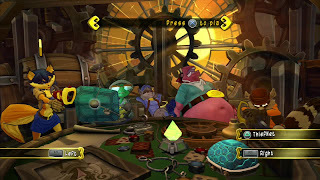 During Sly Cooper and the gang's trip through the past, they will comes across Sly's ancestors, of which there is one in each episode to rescue and have join your merry crew of thieving animals. Each ancestor has abilities that make them indisposable, as they can reach areas that other characters simply cannot. For one, Tennessee Kid Cooper can fire his guns at both faraway foes and faraway targets to activate nearby contraptions. Meanwhile, the oldest Cooper ancestor, known lovingly as Bob, has the ability to scale icy walls to reach higher areas. 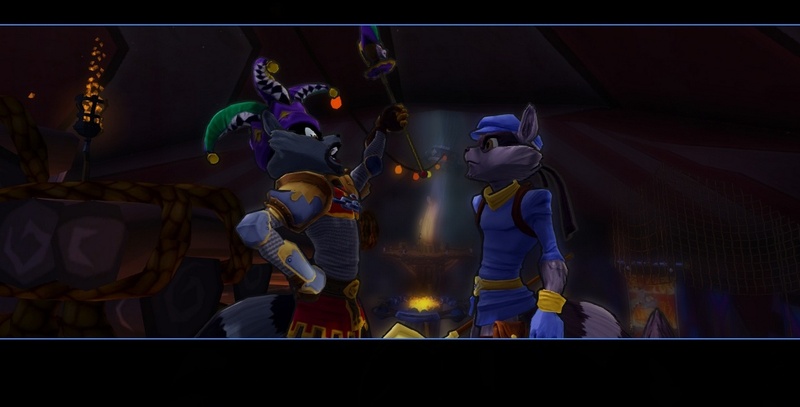 In addition to the ancestors and their powers, there are costumes that Sly Cooper collects throughout his adventure that grants him new abilities, exclusive to each costume. For instance, the Jailbird costume comes with a huge ball and chain, great for smashing breakable walls and to walk on to cross over hazardous and deadly floors. Meanwhile, the Archer costume grants the ability to fire arrows at targets. 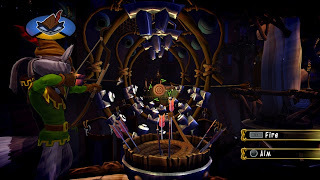 These arrows have ropes attached to them so when they hit their target, Sly can walk on them like a tightrope. The costumes are a welcome feature that only adds to the variety filled package that Thieves in Time is. 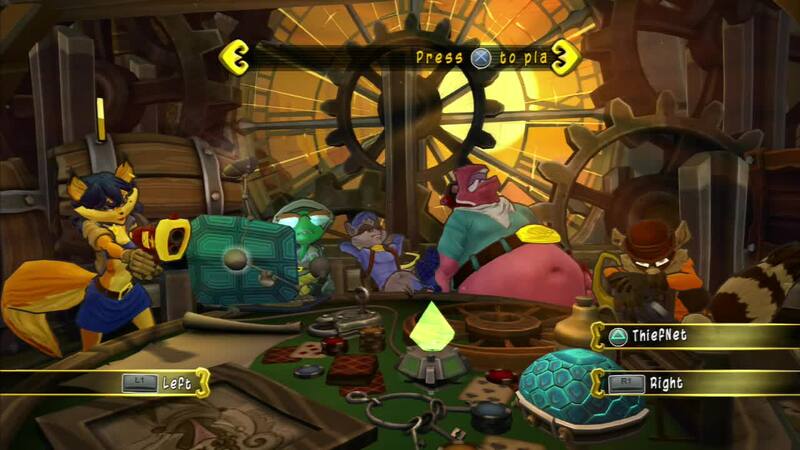 There is a LOT to do in Sly Cooper: Thieves in Time, so even after you complete the 10-15 hour campaign, there's plenty still to do. Collecting all of the clue bottles in a given episode's hub world will open a safe, giving Sly and the gang a useful treasure to work with. Such a treasure includes one that makes falling into the water something that no longer causes damage while another increases the chance of pick-pocketing loot from an unaware enemy. Then there are 60 masks that are hidden through the hub worlds and jobs of the game. 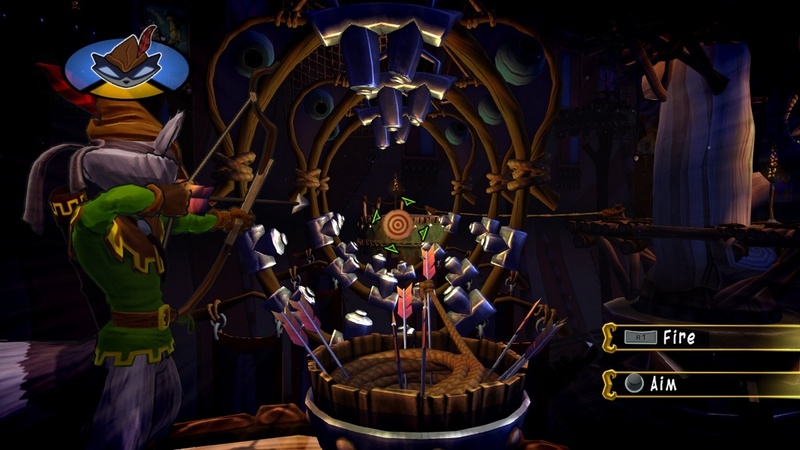 Collecting them gives you options in the extras menu, including replacing Sly Cooper's cane with a certain other PlayStation platforming all-star's wrench. "The Murray" can handle any physical job. Thieves in Time is not without its issues, however. We already went over Spark Runner being a bit unwieldy, but the in-game camera can also be a bit unwieldy as well. It can occasionally get caught on walls, make it so its impossible to turn, and other annoyances that can frustrate. These aren't common, though. While I was playing the game, I had a coworker ask me which game of the PlayStation 2 trilogy I was playing. He honestly couldn't tell that I was playing a PlayStation 3 game. That said, Thieves in Time is a gorgeous game, using a timeless art style with its cel-shaded. It gives its areas more pizzazz, and it makes the characters come to life wonderfully. The voice acting is also well done with clever dialogue thrown in to keep even the oldest of players entertained. Lastly, the music is a dynamic mix of styles that accentuate the platforming action well. Forsooth, my fine ring-tailed friend! Sly Cooper: Thieves in Time is one of the better platformers to have come out this generation. While it stays true to the formula to a degree that some might consider too "safe", it certainly relieved my itch for a new 3D platformer beautifully. It is a humorous and entertaining game, through and through, contains plenty of content outside of the main campaign, and the platforming itself is nothing short of pure fun. The addition of buying the PlayStation 3 version and getting a digital version of the Vita game only increases the value of Thieves in Time. If you're a PlayStation 3 owner who is looking for a platformer with a lot of heart and clever design, take up a job with Sly Cooper and the gang.